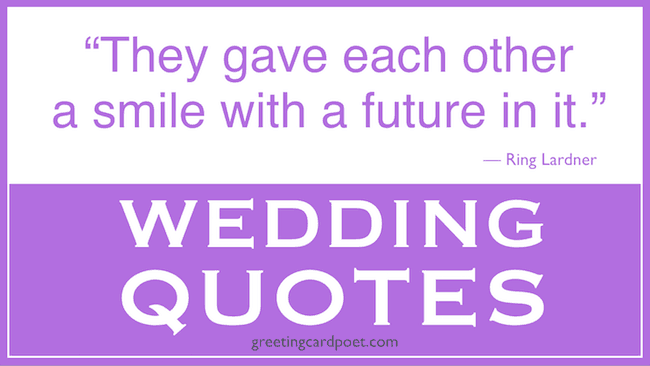 You’re on The Best Wedding Quotes, page 7 of 7 of Wedding Wishes and Quotes. See complete menu at bottom of page. Our collection provides some ideas for wedding programs, cards, bridal showers and more. Marriage is probably the most important relationship in a person’s life. A wedding is the coming together of not just two people, but two families and their friends and relatives. Besides its social importance, marriage has its natural and universal importance. Philosophers and great men and women have always said great things about the institution of marriage. Weddings are associated with true love, best friends, and longevity in this lasting relationship. Here are some of the best wedding quotes that you can share with your to-be-spouse or friend who is about to get married to make them feel special! Marriage is an authentic weaving together of families, of two souls with their individual fates and destinies, of time and eternity–everyday life married to the timeless mysteries of the soul. A marriage is not a noun; it’s a verb. It isn’t something you get. It’s the way you love your partner everyday. This relationship is the vessel wherein is nurtured the life force of both individuals, whereby they create the future of the human race in body and thought. May joy and peace surround you, contentment latch your door. And happiness be with you now—and bless you evermore. You’re on Best Wedding Quotes page.